Sasakawa USA is committed to engaging with Congressional members and staff to promote a greater understanding of the U.S.-Japan relationship. With this goal in mind, since 2014 Sasakawa USA has partnered with the Sasakawa Peace Foundation to support programs run by the Congressional Study Group on Japan (CSGJ), an independent, non-partisan, and non-advocacy organization that promotes legislative exchange between the U.S. Congress and Japanese Diet. Through this support of CSGJ programs, Sasakawa USA provides an ongoing forum for candid dialogue on issues critical to both the United States and Japan, the most important ally and partner of the United States in Asia. Programs have included visits by Japanese delegations to various U.S. states and Congressional districts, exchange programs, and roundtable discussions, each which are important to building a comprehensive view of U.S.-Japan relations while facilitating dialogue at a grassroots level. The cornerstone of these programs are two annual, week-long delegations to Japan: one for Congressional members, and another for senior Congressional staff. Delegates on these trips have the opportunity to deepen their political, economic, historical, and cultural knowledge of Japan through meetings with government officials, Diet members, military officers, professors, business leaders, journalists, and cultural experts who provide a well-rounded view of Japan. In June 2016, nine senior congressional staff members and a former member of the U.S. House of Representatives had the opportunity to deepen their political, economic, historical, and cultural knowledge of Japan while participating in a week-long trip to Okinawa and Tokyo. On October 22, 2015, Sasakawa USA, in partnership with the Congressional Study Group on Japan and in cooperation with the U.S.-Japan Caucus, hosted a briefing for members of Congress and their staff to discuss the implications of Japan’s new security legislation. 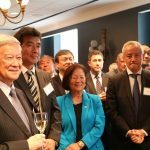 On April 24, 2015, Sasakawa USA and The Congressional Study Group on Japan hosted a discussion on U.S.-Japan relations as perceived by the public, and expectations for Prime Minister Abe’s historic address to a joint session of Congress on April 29, 2015.